There’s been a lot of anger creeping into my corner of the internet: Anger about the unequal or insensitive treatment of women and minorities, specifically within the game industry. As a woman working in games since 2007, I’ve felt hurt, discouraged, and isolated by various forms of discrimination. Most of it came from people who were in no way intending to be hurtful. Anger does not accurately describe my true feelings, and so I don’t feel angry. Disclaimer: I’ve worked on many projects with over a dozen different studios. None of the following content is meant to implicate anyone in particular, and it is not a strictly linear narrative. Let’s say you’re a guy who’s just entered the game industry right out of college. People joke about you being all young and fresh-faced, but then after a couple of months they get tired of the joke, or some new blood moves in and you’re not the “young guy” any more. Now let’s say you’re a woman who’s entered the game industry right out of college. People joke about you being all young and fresh-faced, and after a couple of months they still haven’t tired of the joke, and no other young women have been hired, so you’re still the “young girl.” Oftentimes you’re the only woman in a packed conference room. Oftentimes you’re the only one under 40. You work hard on several good projects, even though some people tell you or your boss that you’re “unqualified” to work on them because you’re “only 22.” You travel to work with developers. Sometimes when you meet a new colleague and extend your hand to shake theirs, they hug or kiss you instead, after having shaken the hands of your male colleagues. At some of these studios, there are literally no other women in sight. There’s a women’s bathroom, but the light is always off, because you’re the only one who uses it, and you have to fumble for it in the dark. If it’s nighttime and you’re walking down the vacated hallway of a shared office building in an unfamiliar city to a bathroom only you use, you feel afraid you’ll be cornered. At some of these studios, there are literally no other women in sight. Years pass. You’re constantly meeting new people and working on new teams. You’re not fresh out of college any more, in fact you’re reviewed well and ranked highly, but you’re still the only young woman in the room, and nobody’s tired of the joke yet. Now, if someone wants you out of their way, they say you’re “unqualified” because you’re “only 24.” Or 25. Or 26. When there’s a decision to be made about who from the company will go visit a developer to discuss a new project, you are told that they really need to send “a guy’s guy… Someone who can hold his liquor, drink a lot with the developers, and earn their trust.” Definitely not you. You have a nice window office. One night, you’re working late. Most people have already gone home. A drunken coworker, also staying late, leans across the doorway of your nice window office and makes slurred conversation with you for about 20 minutes. He starts to make comments about your appearance. He’s still blocking your doorway. You feel afraid, because you don’t know how to get rid of him. Your heartbeat is fast; you glance at a big stupid corporate plaque on your desk and wonder if, in case of need, it could knock this guy unconscious. A friend drops by at the right time and the drunkard scuttles away, but after that, you feel anxious every time you work late. You feel lonely, you feel like a novelty, you feel like a fraud. You feel like you don’t deserve a seat at the table. You’ve had long hair most of your life, but you cut it short in hopes that people will take you more seriously. You’ve met a lot of great people, and you have a lot of friends that you like to work with. Sometimes you don’t feel lonely or like a novelty, like when you’re sitting around the lunch table, cracking jokes with your coworkers. You feel happy and included. But when one of your coworkers makes a joke that is crude, even though it doesn’t offend you at all and you haven’t even had time to laugh, he turns to you and apologizes, because you are the only woman at the table and your delicate sensibilities must have been affronted. You feel lonely again. You feel like you’re not supposed to be at the table. It’s been several years since you were fresh out of college, but still, every time you meet someone new, the odds are good that they’ll make a joke about your age, and even the people you’ve worked with for a while never seem to let it go. You beat yourself up for feeling hurt and defensive about it, because you know they don’t mean any harm – except for the occasional person who makes it clear that they do. One day a coworker leaves an unsolicited, romantically-charged gift on your desk where everyone can see it. You didn’t ask for this, and you feel deeply embarrassed as you hide it away out of sight. On a new project, a certain lead wants to be the only one allowed to communicate with the developer so he can “manage the relationship.” You’re on the team, but miss his memo and send a short, friendly email to the developer that says you’re looking forward to working with them. In response to this violation, the lead writes a very long email with an absolutely volcanic assessment of your personal failings – including your age – and emails it to your boss, the project’s producer, and two other coworkers that you like and respect. Your boss shows you the email, then sits with you and comforts you while you sob in an empty conference room for half an hour. Over the years, other people’s words and actions pile onto your shoulders. You feel enormous pressure to pretend that nothing bothers you, because you don’t want to give others more power to hurt you, or upset people you care about or make them feel uncomfortable. You feel that the things that hurt you would never have happened if you weren’t female, and on a certain level, you feel that you deserve it. So you don’t say anything, you try to ignore it, and the result is an ever-present sense of isolation that chills your enthusiasm and makes you defensive. Many of my female colleagues have similar stories. Some of these experiences made me feel angry when they happened. If similar things have happened to you, or to someone you work with or love, you’ve probably also felt angry. ...a posture deliberately and consciously assumed … for the express purpose of blaming, punishing, or teaching a lesson. … Whenever you get angry at another you are putting on an act, playing a role to affect the other, to show him what he has done, teach him a lesson, try to convince him he shouldn’t do it again. I’m not suggesting that the anger isn’t real. It is very real and makes people boil or shake inside. I am suggesting that people make themselves angry. So I want to submit that what we ACTUALLY feel is fear, disappointment, isolation, sadness, resentment, and self-doubt. Anger is just the outermost layer, like an onion’s skin. You have to peel the first layer, and then the next, to find out what’s buried at the center. When I see rants and accusations about who did what and why it’s very bad and why they need to change and stop being very bad, right now, I feel annoyed and frustrated because I know the only result is that everybody’s gonna feel just a little bit more uptight. How do you feel when someone assumes a posture of anger toward you? Does it make you more or less inclined to listen to them? So let’s everybody peel our onions, and name what we’re actually feeling, and what we’ve actually, personally experienced. It’s a much stronger position to start from, because you can’t debate feelings the way you can debate arguments or comic strips or abstract principles. 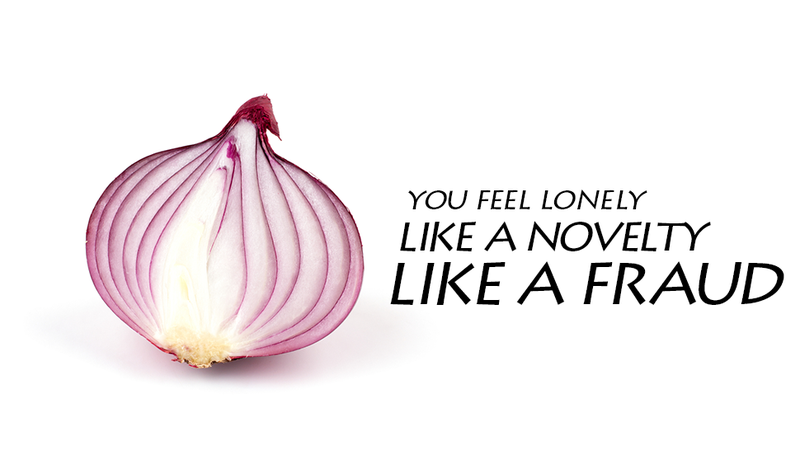 Peel your onion. And then talk. Disclaimer, part II: Over the past six years, I’ve had plenty of good times. I’ve met kind, supportive, creative people, and made friendships that I treasure. Thanks to all of you. Whitney Hills has worked in games since 2007 and has shipped over a dozen titles. She currently works as an independent game designer, writer, and consultant. She tweets as @whitney. This essay was originally posted on her website, Dead Reckon. Re-published with permission.